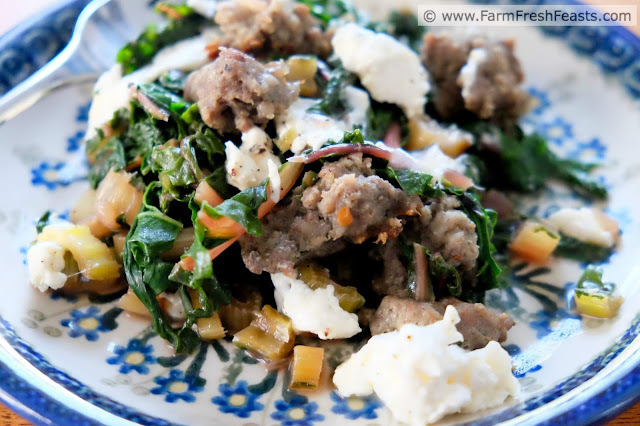 A low carb meal of sausage sautéed with Swiss chard and topped with creamy burrata cheese. It's good to have some simple cooking concepts in your back pocket for when you don't have a particular plan in mind for dinner, but you've got ingredients courtesy of you Community Supported Agriculture (CSA) farm share. This is another simple cooking concept. Mentally [or print it out and physically] file it alongside Fast Greens and Pasta, a Concept Recipe and Fried Rice with Greens and Chicken. These are 3 different ways to get a bunch of cooking greens out of your refrigerator and into your belly. And my family liked them all. Typically I'll serve pasta, rice, or potatoes alongside cooked greens. This time, however, I just wasn't feeling it. We'd been eating a lot of pasta and potatoes, we were out of rice, and I wanted to pare down to just the basics for this meal. It filled us up, used up some gorgeous Swiss chard from the farm share, and tasted pretty yummy. If you don't have Swiss chard, you could make this with kale (toss the stems in that case, they're too woody and would be better for composting guinea pigs or the worm bin). You could swap in Bok choy (use the stems! they taste like celery to me) or spinach. 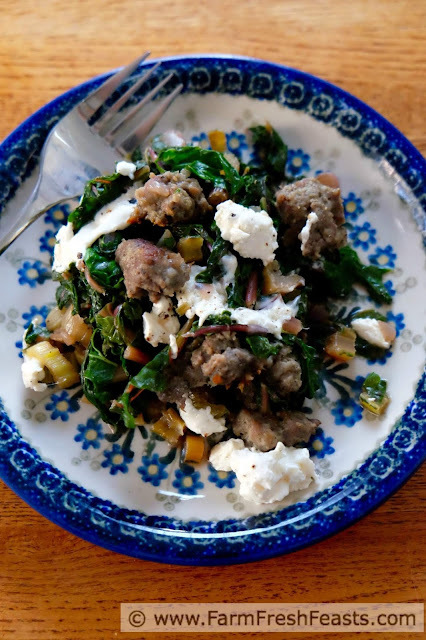 If you want to skip the sausage, you'll need more sources of flavor. Perhaps increase the onion, add some chopped bell peppers, and season with crushed red pepper, fennel, and paprika, and toss in some cooked chick peas for protein and the chew factor. 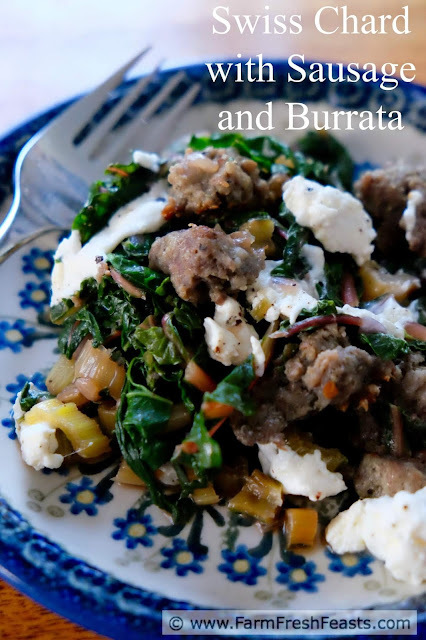 For more recipes using Swiss chard, please see my Swiss Chard Recipes Collection. For more recipes using cooking greens, please see my Cooking Greens Recipe Collection. These are part of the Visual Recipe Index by Ingredient, a resource for folks like me eating from the farm share, the farmer's market, the garden, the neighbor's garden, and great deals on ugly produce at the grocery store. 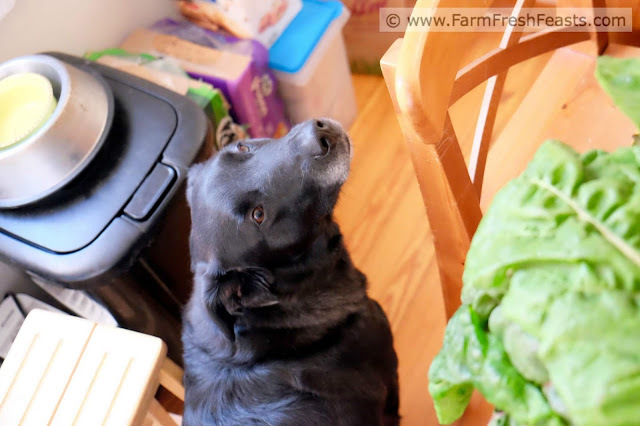 Simon's eyeing the chard, but what he really wants is the sausage. Note: you'll need a large skillet with a lid for this recipe. Preheat a large (12 inch) skillet over medium low heat. Mine is well seasoned cast iron so I did not use oil. If you need oil for your skillet, add a turn of cooking oil at this point. 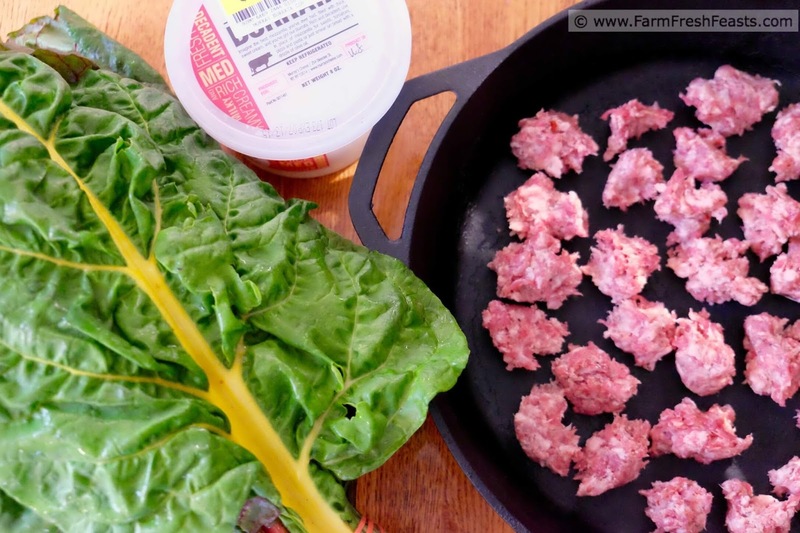 Pinch off small balls of sausage and place them in the preheated skillet. While the sausage is browning on one side, separate the chard leaves from the stems. You can see my son doing that here. Chop the stems into small pieces about the same size as your onion. Slice the leaves into ribbons and set aside. After 5-8 minutes, when one side of the sausage is browned, flip each piece over to cook on another side. 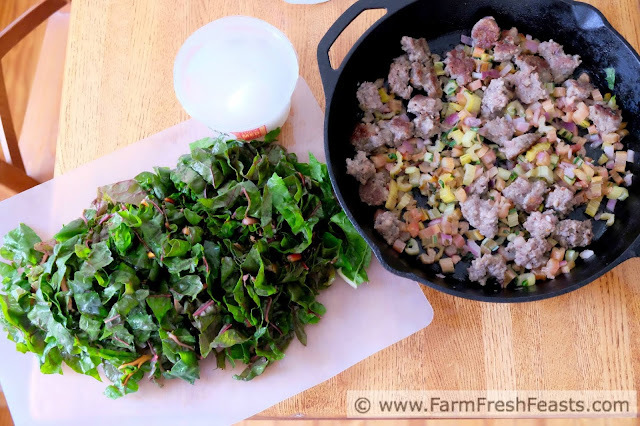 Increase heat to medium once you're finished chopping the vegetables and can pay full attention to the sausage. As the sausage is fully cooked through, transfer to a plate. 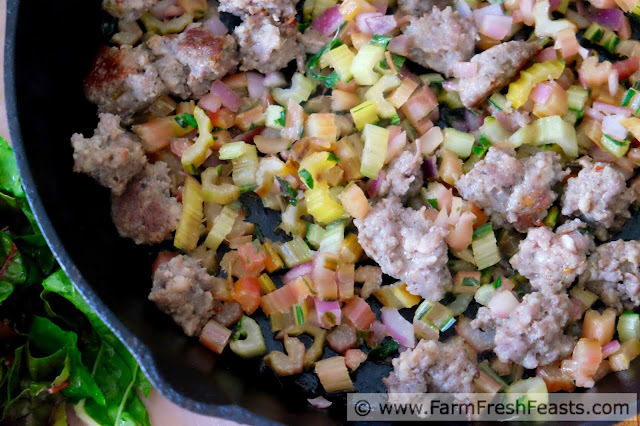 When all of the sausage is cooked, add the chopped chard stems and the onion to the skillet. I do not need to add oil as the fat has rendered from the sausage, but if you feel the skillet is too dry go ahead and add a turn of cooking oil. Cook the chard stems and onions over medium heat for 8 to 10 minutes, stirring occasionally, until they are softened. Sprinkle a generous pinch (about ½ teaspoon) each of salt and pepper to the onions and peppers. Add back in the cooked sausage and stir to combine. Scatter the sliced chard leaves on top and fold in with the rest. Cover and cook for 3-5 minutes until the leaves wilt. Remove from heat. Uncover and add a splash of vinegar to the skillet. Rip open the burrata cheese, scattering it atop the contents of the skillet. Serve, and have salt and pepper at the table. Robert Barker? He'd eat the whole thing if I absented myself from the kitchen. 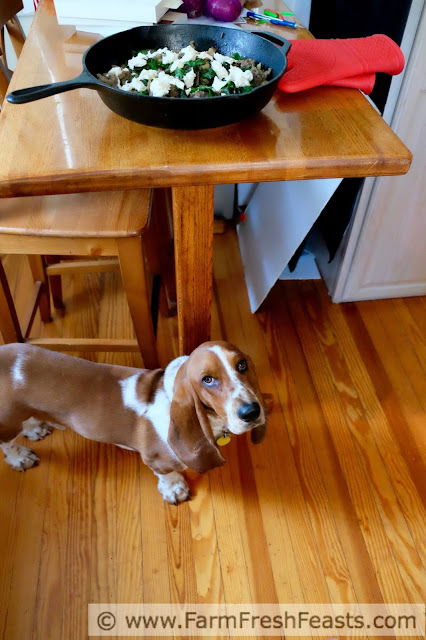 Those short legs are deceiving. He's snagged coconut cream pie, bread, pizza, and muffins from the counter tops.